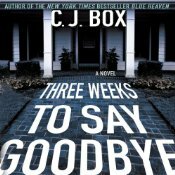 I have not read any of C J Box’s long-running Joe Pickett series (primarily because I just don’t have the energy to launch into yet another series where I might be compelled to start at the beginning) but I am fast becoming a fan of his standalone thrillers. This one has a very good hook and kept me gripped right to the end. Jack and Melissa McGuane receive the worst news possible: their adopted daughter’s biological father, Garrett Moreland, never officially relinquished his parental rights and he, or at least his father, wants nine-month old Angelina. Garrett’s father is a well-respected Judge in Denver and has the law, money and considerable influence on his side. On their side the McGuanes have two old friends, Cody who is a detective with the Denver police and Brian a wealthy property developer, along with a fierce love for the daughter they have raised. Judge Moreland, claiming a desire to ensure his tearaway son accepts his responsibilities, offers the McGuanes a final three weeks to spend with Angelina before taking the baby into his own family. The mystery component to the story surrounds the McGuane’s growing belief that there is a more sinister reason for Judge Moreland’s demand to have Angelina. The story is told in the first person from Jack’s point of view. This is a good voice for such an emotional story as it allows the raw frustration and impotence that Jack feels at not being able to save his family to really shine through. I’m sure the temptation would have been to tell this kind of story from the mother’s point of view but I think it was probably stronger for being told from the father’s perspective. The downside of using a first person narrative is, as always, that there are times when action is taking place that Jack can know nothing about and as a reader you do feel that at a couple of points that Jack is mulling over his situation again while the real plot is advancing elsewhere. While the bad guys in this novel were pretty much rotten to the core the good guys offered more depth. The character of Cody for example was used to good effect to depict an ever-present tension between following the letter of the law and achieving justice which, as most of us probably believe, are not always the same thing. The slow disintegration of both Melissa and Jack in terms of their willingness to consider increasingly risky and illegal behaviour is also interesting if not always entirely believable in Jack’s case. I did find the ending of the story a bit over the top and the very last chapter lost the book half a point on my personal rating scale for being just too cute and ‘preachy’ but overall I was entertained by the novel and was definitely rooting for the McGuanes. I am a bit weary of the crime and thriller genres being so dominated by series books so am pleased to have found another author who, at least every other year, is prepared to offer a story that can be read within the confines of a single book. This is the first book I have listened to by John Bedford Lloyd but it won’t be my last as he is a terrific reader which is not surprising given his long career as a character actor in the US. I’ve already added several more of his narrations to my audible wishlist (there are dozens more unavailable to people in my geographic location but I shan’t turn this review into another gripe on that issue). At the end of the book there is a short interview with the author CJ Box which is not particularly hard-hitting but does offer a few snippets of information about the process he uses to create his novels and his inspiration for this particular story. Three Weeks to say Goodbye has been reviewed at Material Witness and Petrona. CJ Box’s other standalone thriller, Blue Heaven, was among my top ten reads for 2008. Bernadette – Thanks for this review. I’m glad you liked this one; I agree that it’s taut – even haunting – throughout most of the novel. You’re right, too, that the first person voice is an effective choice for the novel, as it really conveys the mounting suspense. Overall, this one really was a solid book, and I’m glad you thought so, too. Ah, I am glad I have this one on my TBR. I am rather partial to series, though, but I agree that if I realize the writer has written more than ten volumes already, it feels a bit hopeless. Perhaps that is why quartets have become popular recently? I liked this book, too – reminded me rather of Linwood Barclay or a bit Harlan Coben-ish. I liked the character of Jack – not “liked” in the sense of wanting to be his friend, but thought he was a sympathetically flawed protagonist. Interesting that you make the point about the OTT ending. I’ve read two (standalones!) by this author and this is my main criticism of both books – the OTT violent, too persistent, endings. For me, just not necessary but perhaps considered “commercial”. I liked this review and agree with its star rating. And I agree on your criticism of the over the top ending. I saw the similarities to Linwood Barclay (and Harlan Coben), although I think Barclay at his best, writes better thrillers than this one (ouch, I know). I think I need a bit more substance, even with thrillers. I do also wish the endings weren’t crazed, violent and over the top. I stopped reading a few series for this reason; the endings just became ridiculously contrived, violent and unbelievable.